One of the best ways to keep your dog healthy is to feed them the right amount of food! Too little and your dog can suffer from nutritional deficiencies, and too much will eventually cause obesity and the many health problems associated with obesity. Unfortunately, there is no easy way to know how much your dog needs to eat. Determining the amount of food to give your dog will depend on the type of food you feed your dog, how many times a day they are fed, how big they are, their metabolism, the amount of exercise they get, and many other factors. But you can figure out an approximate amount of food that should work for your individual pet, or you can ask your veterinarian. If you're wondering how much your dog is supposed to be eating, start by checking the feeding guide on your dog's food label! They are usually presented as a table, with Weight of Dog and Amount Per Day being the categories on the columns. Keeping in mind that these amounts are the total food your dog should consume in a 24 hours period. Seeing as adult dogs generally take 2 feedings a day, and puppies usually require 3 or 4, you will need to divide this amount by the number of feedings your dog gets per day. Use this information combined with your knowledge of your dogs life to find the initial amount of food you should be offering. For example, if you have a 35 pound corgi who is not very active, maybe start with 2 cups of food per day. If you have a 35 pound Border Collie who is constantly moving, start with a little more. Have an hourglass figure when looking down on from above, their abdomen should be narrower than the chest and hips. Be 'tucked up' from the side. When standing, their chest should be closer to the ground than their stomach when viewed from the side. Have ribs that are not visible, but easily felt when applying light pressure. 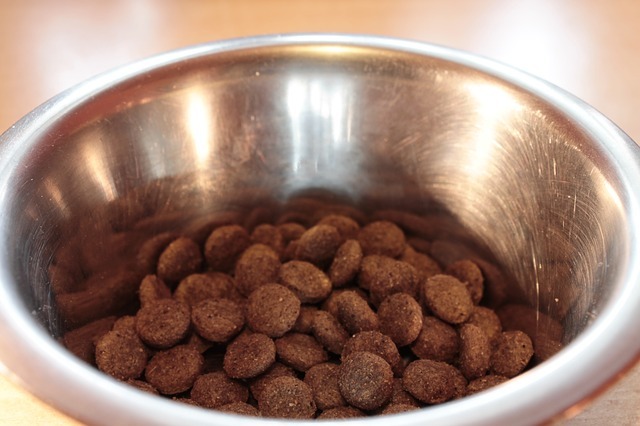 Remember, each time your change dog foods, you will have to go through this process again. If you have any concerns about your dogs health and diet, ask your veterinarian. They will be able to help you determine the correct amount of food to feed your dog based on the specifics of your dogs case!